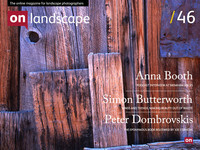 I have been following Simon Butterworth's photography since I saw his images on photo.net and ephotozine sometime ago. Since then his photography has gradually changed and what better recognition of that change than winning recognition in one of the world's most prestigious photography prizes. Simon won Bronze in the 2012 Juried awards of the Prix de la Photographie Paris for an excellent series documenting the 'Bings' of Scotland. The Bings are Scotland's version of the great oil/gas rush that is currently happening in Alaska and America but in this case the oil shale was baked in great ovens to remove the oil. The detritus of what made Scotland the biggest oil producing country in the world at the time are the great read mounds that make this landscape look so otherworldly, almost a Scottish Uluru. Simon visited the On Landscape offices last week and we interviewed him about his project and along the way looked at his personal history of photography and what his plans are next.